All ticket sales are subject to the following terms and conditions. 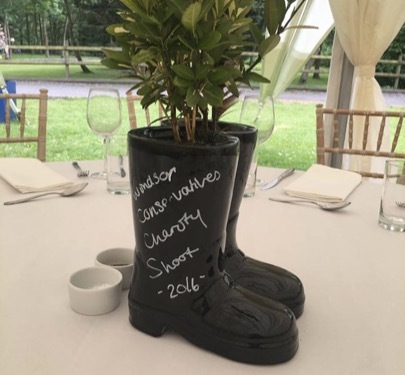 Booking Except where stated otherwise, all events are open to Conservative Party members and supporters. Windsor Conservatives may decline to sell tickets to any individual at our sole discretion. Refunds Unfortunately, Windsor Conservatives cannot offer refunds, except where we have to cancel an event, at the sole discretion of the Chairman, or where we have declined to sell tickets to an individual. At our discretion and subject to any security considerations, we are, however, happy to accept named substitutions in writing in advance of the event. Alterations We try to avoid it, but very occasionally we have to make alterations to an advertised programme due to unavoidable circumstances. Late Admission Admission to latecomers is not guaranteed, although offered wherever possible. Tickets Unless stated otherwise, printed tickets are not issued for events but guest names may be checked on arrival. We reserve the right to use the information supplied when booking tickets for events to inform attendees of future events and activities which may be of interest. Contact details are never passed onto any third parties and individuals may opt out of future communications from us at any time. We often photograph and/or film our events. If you would prefer not to be caught on camera, please let a member of staff know, either in advance or on the day. This policy is provided to inform those, who may or may not be members of Windsor Conservatives, of their responsibilities with regard to film and photography involving images of individuals at our events. Private events If photography is prohibited at a particular event because it is private, this will be made very clear to all attendees. Personal use If photographs taken at public events are for personal use only, then no consent is required from individuals photographed. Please note that you are free to put your photographs/film on social media sites. However, we accept no responsibility for any action occasioning against an individual for posting an image on any site, as this is beyond our control. Courtesy for others Please be mindful that some people may not want their photographs taken, therefore if you are asked to stop taking photographs, we ask that you respect those wishes. If on a rare occasion a member of staff has concerns over the actions of someone taking photographs, they will speak to the photographer concerned in a discreet and courteous manner. Official photographers If a photographer has been commissioned by us to photograph an event they will be clearly identifiable. If you do not wish your photograph to be taken, please make the photographer aware. Please also note that any image or photograph taken by an official photographer will only be stored and used in line with the principles of the General Data Protection Regulations. The safety and security of everyone attending our events is of prime importance to us. We, therefore, reserve the right to ask anyone who does not respect this policy to leave an event. We love to hear from everyone who attends our events, so if you have any comments or suggestions, please do get in touch by calling 01753 678694 or emailing us at office@windsorconservatives.com.